From Carmen Jane Booth D.V.M., Ph.D.
Did You Know? 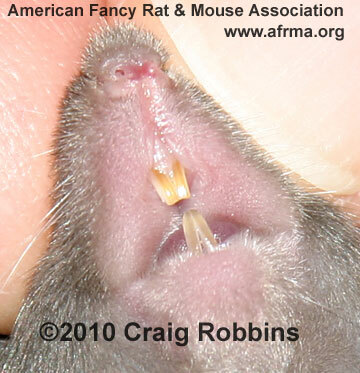 (RE: It’s In The Teeth, WSSF2011:29) The brown color on the teeth of WT or normal mice is due to iron deposition in the enamel. White enamel is due to failure to incorporate iron into the enamel due to many different genetic mutations. 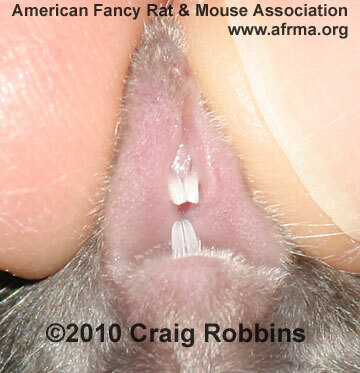 The teeth of a 6-week-old Black Satin female. Idea from Monica Amadigi in Switzerland http://www.redcarpetmaus.ch.
. . . and the Black Standard sister showing normal color of teeth. Mice owned and bred by Karen Robbins. Photos ©2010 Craig Robbins.